Mirchi ka salan is another popular and typical Hyderabad dish. It is accompanied with Hyderabad Biryani, Bagara Rice and Jeera Rice also. 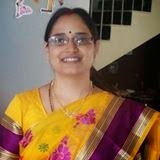 It is prepared mostly in wedding and special occasions. Green chillies cooked along with peanuts, sesame seeds and coconut gravy. We get special chillies for this in this season. They are mildly spicy or sometimes no spicy at all. Slit green chillies, without removing the crowns. Dry roast sesame seeds, peanuts and coconut. Roast them separately and in the same order as I gave. Heat oil in a kadai, fry green chillies for 2 to 3 minutes or till they become soft. Keep them aside. Again heat oil in the same kadai, add mustard sees, cumin seeds, fenugreek seeds and red chilli. When they start spluttering add onions and fry them till they become translucent. Add ginger garlic paste to it and fry it till the rawness of it goes off. Add turmeric powder, salt, red chilli powder and coriander powder. Mix well. Let oil oozes out, add above grounded salan paste to it. Again mix well. Add water to it. Add curd and mix well. Add green chillies and mix well and allow this to cook for 15 minutes in low flame. Once it starts boiling tamarind juice and jaggery. Allow this to cook for another 10 minutes. 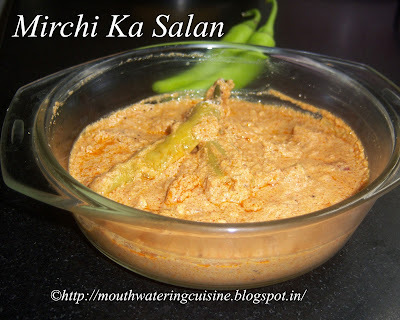 Serve mirchi ka salan with bagara rice or any flavorful rice.